Marvel at the architectural designs of hotels and lodges along the banks of the mighty Zambezi River. They depict changing themes, moods and designs. The architectural designs and beauty mesh perfectly with the wonder world landscapes. On the Zambezi River, above the Victoria Falls , the spectacular sunsets and sunrises are exquisite and beyond expectation. This is Zambia...the real Africa! Enjoy the hospitality of Zambia! Pick your choice from the wide and varied selection of accommodations. You will marvel at the architectural designs and the beauty depicting the moods of the changing terrain. Some of the designs of these lodgings are so well crafted that they mesh with the environment as if nature made them. 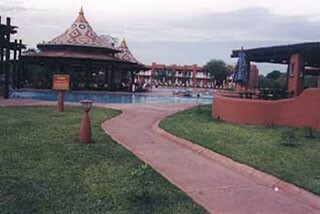 Hotels are the major support of the African safaris, travels and holidays. Besides hotels your choice of accommodations includes motels, game lodges, private game reserves, guesthouses, and fishing camps. And that is not all. There are also campsites, chalets and backpackers. Accommodations to suit all! Lusaka, Zambia’s capital has high class and exciting accommodations including lodges, motels. The 5 star Taj Pamodzi, 5 star Hotel Intercontinental, Holiday Inn, and game lodges are among the best. Book in the exciting Lilayi Lodge, Protea Safari Lodge, Chisamba and Chaminuka. They are among the most rewarding accommodations in private game parks. They include game viewing on horsebacks safaris, walking trails, restaurants, pool, tennis, and Internet café. Livingstone , Zambia’s tourist capital, has a unique assemblage of accommodations. First off, the Sun International's own; The Royal Livingstone 5 star luxury hotel on the banks of the Zambezi and The Zambezi Sun, a 3 star hotel minutes from the Victoria Falls (both opened in April 2001). They are built close to each other and mesh comfortably with the landscape. A not to keen observer could drive by without seeing them. The Royal Livingstone has been particularly famous. It has hosted presidents, film stars and a host of other VIPs. Allen Harkness, the chairman of Livingstone Tourism Association (LTA) says that, "Tourism in Zambia has beaten the tourism of the neighboring Zimbabwe. Today, Zambia is recognized as the world-class tourist destination. This is in recognition of fact that British Broadcasting Corporation (BBC) has designated two hotels; The Royal Livingstone in Mosi-oa-Tunya Game Park and the Sausage Tree in Lower Zambezi game park as leading world class luxury destinations." "In addition Tongabezi, also in Mosi-oa-Tunya Game Park, has won 5 awards from the United Kingdom and the United Sates of America as the most unique destinations in the world. The book ”One of the Places You Should See Before You Die” has featured all three hotels; The Royal Livingstone, Sausage Tree and Tongabezi." Now you can sample the hospitality of Zambia. Click here to choose the accommodation that fits with your leisure, pleasure and relaxation. However, you can also make bookings of the world’s most exciting hotels of your choice. For your car rentals and travel agents visit here . Your visa fees will be waived if you choose to engage Zambian based safari operators.